If you are looking for complete peace of mind when it comes to what exactly is in your water, here are several of the best in line water filtration options. We are examining 10 different in line water filters. The first six are designed to be used in the line to a refrigerator or ice maker, or used in line to your kitchen faucet or coffee maker. The next two are designed for whole house use. The last two are for specific unique applications for washing machines and RVs. he Pure Water In Line Water Filter Kit provides much better tasting water and ice. The odor and taste of chlorine is significantly reduced, or completely eliminated. The direct in line filter kit will work with most ice makers. This in line water filter has been tested and certified by NSF International against the ANSI/ NSF Standard 42 for Taste and Odor Reduction and Chlorine Reduction Class I. The Service life of the Pure Water In Line Water Filter is 1,500 gallons of water or approximately 1 Year. For replacement filters use Pure Water Filters Model No. PWF10. The in line water filter unit measures 10.3 inches x 6.4 inches x 4 inches. This Pure Water In Line Water Filter is an economical solution for most ice makers. It is easy to install using the quick connect fittings, which are included in the kit’s package. The Pure Water In Line Water Filter can be placed conveniently in several different locations such as under the sink, in a cabinet, behind the ice maker or behind the refrigerator. The Pure Water In Line Water Filter can be used as well for an under the counter water filter system for your kitchen faucet. Also, beverage equipment or water fountains can use this in line water filter kit. Pure Water provides FREE Lifetime Warranty and Telephone Support. Get any help you need with installation, any trouble shooting tips, and any answers for product related questions. The National Academy of Medicine now recommends that an adult male needs to drink up to 15 cups of water daily and an adult female need to drink up to 11 cups a day. A clean water filter creating an easily accessible, abundant, pure water source encourages this. Clean the tap water so there is no more bad taste or odor and you will certainly be more inclined to drink more water. This Lasco 37 – 1821 Ice Maker In Line Filter controls the scale build up and corrosion in the water line. It will filter out the contaminants in the water to make a clean, fresh taste. It uses standard 1/4 inch compression connection fittings for quick installation, and easy filter replacements. The unit itself measures 2 Inches x 10 Inches. This is a convenient size for placing behind ice machines, refrigerators, in a cabinet or under the sink. This Lasco 37 – 1821 Ice Maker In Line Filter will filter approximately 1,500 gallons of water, depending on the initial water quality. Change this water filter once per year for recommended cleanliness. Lasco offers a 1 Year Warranty on the Lasco 37 – 1821 Ice Maker In Line Filter. The Watts Premier In line Water Filter is perfect for both residential and all types of commercial ice makers as well as refrigerators, coffee and tea brewers, water coolers, drinking fountains, campers, boats and motor homes. This filter will reduce chlorine odors and taste. It will also reduce the scale build up in the appliances. It inhibits any bacterial growth, too. It will filter up to 20,000 gallons or about 1 year, depending on water usage and initial water quality. It is best to inspect it at least every 6 months, but it is otherwise maintenance free. The Watts Premier In line Water Filter is super easy to install. It connects easily with any existing plumbing. The Watts Premier In line Water Filter uses a KDF fluid treatment for filtration. Kinetic Degradation Fluxion (KDF) is a copper- zinc, high- purity formulation that uses a chemical process called redox (oxidation/ reduction) that removes chemicals that are creating unpleasant tastes or odors in the water like hydrogen sulfide which gives a rotten eggs smell, or chlorine that smells like a swimming pool. 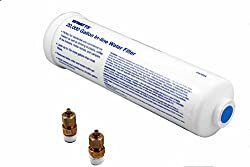 The Watts Premier In line Water Filter Cartridge comes with a 10 inch KDF In line water filter and the 2 pack of the 1/4 inch brass connectors. Compatibility: The Watts Premier In line Water Filter works with any water supply that uses 1/4 inch supply lines. Premier has their headquarters in Peoria, Arizona. Since they were founded in 1989, their company goal has been to develop, design and market the highest possible quality water filtration systems they could, at a reasonable and affordable price, while providing exceptional customer support. Water filtration is the complete focus of this company. Premier has core competencies that include design, and assembly, plus the manufacturing of several different types of water treatment systems. They market water filtration systems, reverse osmosis systems, full water treatment and purification systems. The product line includes a complete suite of water filtration systems, a water savings product line, water testing equipment and their components. Premier currently holds five different patents that pertain to their unique water treatment systems. Their engineers are continuing to develop new and uniquely innovative products for the end user to benefit from. Premier offers exceptional warranties. They stand behind each product they sell. They are that confident that customers will be satisfied with their prices, products and their service. Every Premier product us backed by their experienced staff of specialists. Help is always available for any problem or question, through their website or through their customer service department. They believe in providing exceptional support for their products. The Watts Premier In line Water Filter System comes backed by the Watts 130 years of industry experience and quality. To ensure ease of installation and maintenance there is a staff of full customer service reps and a technical support team that can be called for assistance. The unit measures 10 inches by 2.5 inches by 2.5 inches and has a 1 – Year Limited Warranty. This EZ- Change In Line Ice maker and Drinking Water Filter is backed by Culligan’s manufacturer limited two – year warranty. 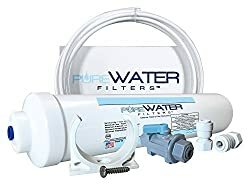 This EZ- Change In Line Ice maker and Drinking Water Filter has a replacement filter cartridge with super quick connect fittings, that you just twist on and then twist off to install or change the filters. The included RC – EZ -1 filter cartridge will reduces particulates of class III, plus chloride and it removes the bad tastes and odors from your tap water. 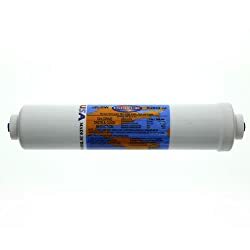 This included RC – EZ – 1 filter cartridge has been tested and internationally certified by NSF International to NSF/ ANSI Standard number 42 for “the aesthetic reduction of Chlorine Taste and Odor and Nominal Particulate Class III”. That means your water and ice will taste clean, clear and fresh. The cartridge will filter up to 3,000 gallons of water depending on the initial quality of the water or could last for up to12 months depending on usage patterns. This Basic EZ Change inline water filter system will provide fresh, clear, clean, great- tasting water for ice maker or refrigerator systems. The included RC – EZ -1 basic filtration cartridge will filter up to 3,000 gallons of water and will last up to 12 months. You can avoid the mess and inconvenience of changing out traditional cartridges while eliminating the need for the buckets, towels, wrenches, and other tools used in the old, traditional style non – EZ change out systems. This Culligan EZ – Change Ice maker and Drinking Water Filter assures that your family has a fresh, clean, clear, abundant water supply from the refrigerator’s water dispenser and the ice maker. It features a terrifically handy twist – on and twist – off mechanism for super easy filter changes. The in line water filter device will protect against many bad tastes, smells, and many harmful particulates that often exist in even municipally treated water. The EZ- Change Filter features a 3,000 – gallon water filter capacity and has been NSF certified for your drinking safety. The Culligan EZ-Change Icemaker and Drinking Water Filter can be connected to both the ice and water supply lines, so this filter will remove the bad odors and tastes, chlorine odors and tastes, plus particulates or sediment that could penetrate the water on the inside of the fridge. Your water will not just taste terrific, but it will also surely maintain its clean, pure, fresh smell, too. The EZ – Change Filter fits very easily into the refrigerator’s water supply system to keep nice, fresh water and super, clean ice at your family’s fingertips. It is designed with your convenience in mind. This light weight in line water filter can be replaced in just a few minutes with a simple twist – on and twist – off process. The handy quick – connect fittings are there to ensure that the filter will stay right in place until it requires a change, so you do not need to worry about any hidden spills or leaks ruining your cabinets or the wall behind the fridge. Culligan is long recognized as a world leader in water filtration and softening products. Culligan carries filtration and treatment system solutions that are available for all areas of the household. The Culligan drinking – water and working – water in line water filtration systems help solve the tough water problems so you have clean, fresh, clear water for your entire household. The unit measures 13 inches by 5 inches by 4 inches which is large enough to do the job yet narrow enough to fit nicely behind cupbards, the refrigerator, coffee maker unit or ice maker. The Woder 10 K – JG – 3/8 Ultra High Capacity Commercial Ice Machine is designed so you can enjoy tap water that is as healthy and pure as natural spring water. The advanced selective filter technology on this in line water filter removes heavy metals, chlorine to 99 %, mercury, chromium 6, lead, carcinogens, tri halomethanes, P F Cs, T M Hs, V O Cs, Glyphosate, detergent, and many other contaminants to 99 %. The Woder 10K – JG – 3/8 Commercial In line Water Filter also will remove turbidity, plus any unpleasant tastes or odors. In fact, it will remove 99.9 % of all of the contaminants but none of the essential minerals. The Woder filter attracts and then filters out 99.9 % of all of the contaminants, but the filter then leaves behind the naturally occurring essential minerals that are vital for good health, like calcium, potassium and trace sodium amounts. This is a much healthier system than water that has been filtered by reverse osmosis. The water filters that work using the reverse osmosis process remove absolutely everything, even those essential minerals. That is why your water filtered by reverse osmosis will be described by most experts as “dead” water as it lacks those essential minerals that this Woder in line water filter will leave in the water so it is “alive” for your health. The Woder 10K – JG – 3/8 Commercial In line Water Filter is super easy to install. It just takes about 5 to maybe 15 minutes to install in pretty much every environment. There are no special tools or plumbing training required. In many cases the process of deciding where to mount it can take almost as long as the installation itself. The Woder 10K – JG – 3/8 Commercial In line Water Filter does come with absolutely everything you will need for a quick and easy installation, including the built – in J G sonically welded connectors for on both sides for the 3/8 inch plastic or copper water lines. It does not work with water supply lines that are not 3/8 inch. It will not fit braided hoses. Also available in 1/4 inch quick connect. These Woder Filters are registered with the E P A. You will see it right on the label. 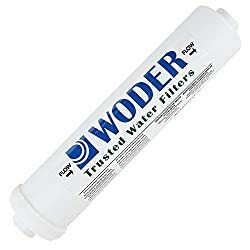 The Woder filters are solidly built with only N S F approved materials ( NSF 61 ) and they are tested by the independent laboratories to the N S F / ANSI number 42 Protocols, plus lead, so you never need to wonder about the quality of this filtration system. The Woder filters have been submitted for W Q A tests that are expected to be N S F certified by May of 2018. The manufacturer of these Woder filters conducts tests independently with the Spectrum Labs AZ and with Clearbrook Labs. The Woder 10K – JG – 3/8 Commercial In line Water Filter is rated for use for up to 3 years or 10,000 gallons. It is recommended that for longest life the inline water filter be used with municipal water only, and not well water, unless it has been tested to be as clean as typical municipal water. This system is not to be used with salty water, nor with residentially or commercially softened water. The inline water filter only connects to the cold water supply line for cold water drinking. When your water is pure and healthy because it includes the essential minerals, it is the way mother nature has intended our drinking water to be. By contrast, other residential filters that are working using a reverse osmosis system will filter out absolutely everything, even including the essential minerals that your body really needs for optimal health. As far as nutrition is concerned, experts consider water that has been cleaned using reverse osmosis to be essentially dead water. The system measures 12.2 inches x 2.8 inches x 2.8 inches which is well within the range to be able to hide it behind a water fountain, water cooler, commercial ice machine, commercial coffee maker, or refrigerator for commercial use. The water temperature needs to stay in the range of 3 degrees to 50 degrees Celsius, or 37 degrees to 122 degrees Fahrenheit. With this commercial in line water filter you can enable employees and customers alike to really enjoy pure, healthy, fresh fountain water on tap, with perfectly clean, pristine ice. The Omnipure K 2533 JJ Inline Water Filter will reduce the chlorine taste and odor in your refrigerator ice and water, or in any in line water supply. It is ideal for coffee makers, water fountains and kitchen sinks because of the great value. 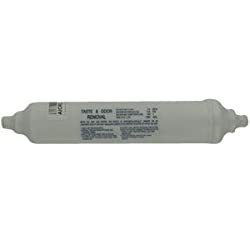 This filter can also be used in commercial or residential ice makers, beverage equipment, under the counter systems, Reverse Osmosis Systems and in conjunction with other water purification systems. The Omnipure K 2533 JJ Inline Water Filter comes with built – in 1/4 inch quick – connect compression fittings that make for super easy install with no tools of any kind required. With 1/4 ” plastic water supply lines just remove the cap from the ends of the filter (after rinsing it thoroughly) and then you push the line into each end of the filter. No tools required. It automatically locks and seals. Check the water flow direction carefully as it is marked on the filter. Making sure the water flows in the correct direction is the only trick to installation. The 1,500 gallon filter capacity means there is no ongoing maintenance, but you will want to replace filters about once a year, depending on the initial water quality and usage. The Omnipure K- Series K 2533 – JJ filter is a post R O acid washed G A C in line water filter. This filter therefore aids in the removal of bad tastes, and odors including any chlorine taste and odor. The dimensions are 2 inches wide by 10 inches long, which is narrow enough to fit behind a fridge or ice maker in the normal amount of space left for ventilation. It has a flow rate of 0.5 (one half) G P M which is well adequate for ice makers, and for filling a water bottle. The maximum pressure is 125 P S I G which is well within range for typical household and commercial plumbing regulators. The maximum temperature is 100 F which is a bit lower than some others, but since it is designed for cold water drinking and ice supply lines it is unlikely to ever be a concern. The expected service life is 1 year or 1,500 gallons of filtered water. The Omnipure K- Series K 2533 – JJ filter is using a granulated activated carbon filter with a volume of 18.5 cubic inches. The Omnipure K 2533 – JJ has been thoroughly tested for ultimate performance under N S F Standard number 42. The idea behind a whole house system is that every faucet and every pipe in the household is full of clean, fresh, clear water. It is common for households that use well water to simply consider a whole house system to be a requirement, but more and more households on municipal treated water are choosing to treat their water. Healthy water is used for drinking but health conscious individuals understand that a shower or bath in the contaminants that are common in municipally treated water are not good for their health, any more than drinking the water would be. Whole house systems are surprisingly reasonable in terms of price, and are easy to install. They are certainly gaining popularity quickly. The Culligan HF – 360 A Whole House Standard Duty in line water filter is ideal for residential homes, helping to protect appliances and plumbing from sediment and scale. Households using well water, or municipally treated water will find the system works well. It is easily installed, reasonably priced and provides a whole house of clean water for about what it costs for a single tap. The clear housing makes it especially good for those using well water as the water quality can vary, so a quick visual check is all that is required to be sure all is operating as it should. Washing machines, dishwashers, hot water heaters, faucets, toilets, showers, and many refrigerators have two things in common. # 1 They are mighty expensive, plus # 2 they use your household water. It makes sense to protect these valuable appliances from sand, rust, scale, and sediment with the use of an in line water filter. The Culligan HF – 360 A features a 3/4 inch N P T inlet and outlet for the simplest installation that uses either brass or C PVC fittings that adapt to the size of your water line. One of the really key features of the Culligan HF – 360 A is that it has a transparent housing sump so you can see the filter as it is working in action, so it helps you to stay on top of your water quality in the household. The Culligan HF – 360 A also works as a chlorine filter when you use the SCWH – 5 filter. It is a carbon wrapped filter that reduces chlorine, that also has a poly – spun 5 micron core to filter out rust, sediment, scale, silt and sand. The whole house in line water filter unit is to be used on the cold water supply line only. Plumb it in between your main water shut – off and the hot water heater. This not only protects the in line water filter from excessive temperatures, it also assures your water heater will be protected from contaminants in the water supply as well. The Valve – in – Head (VIH) patented technology allows you to easily change out the in line water filter cartridge replacement. Valve – in – Head requires only a half – turn of the shut – off valve in the cap to shut off the water supply completely when you are changing the water filter. Quick and easy installation. Temperature Range is: 40° F to 100° F.
Pressure Range is 30 – 125 PSI. The Culligan HF – 360 A Whole House Standard Duty in line water filter features a built – in shut – off valve, and a clear housing unit that will allow quick visual monitoring of the cartridge use. The Culligan HF – 360 A housing has been tested and certified by the W Q A against NSF /ANSI Standard number 42 for material safety and structural integrity. The unit measures 6 inches x 6 inches x 14 inches and has a 1,000,000 (one million) gallon 5 year limited warranty. The DuPont WFPF13003B Universal Whole House in line water filter technology increases the freshness and clarity of your entire household’s water by reducing the sediment, which also extends the life of all of your appliances that use water. The filters and in line systems can surely be used as well at the office, and they fit almost all other brands of whole house in line water filters. 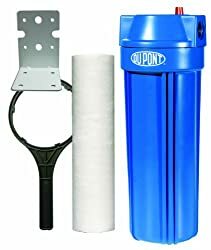 The DuPont WFPF13003B Universal Whole House in line water filter system uses a standard 10 (ten) inch filter that is pretty universally available. Brands include Dupont, Culligan, and Micronex, plus many others. Never worry about getting replacement filters, or having to replace the entire system because you can’t find a new filter. The DuPont WFPF13003B Universal Whole House is ideal for residential uses where the municipal water supply needs to be supplemented. With many different replacement filters available it is ideal for assuring the safety of the household water supply for drinking water, and for appliance longevity. For many people who rent an apartment or house, a full whole house system is not practical. So, you may be looking at filtering water at the use points, such as at the fridge or tap. But what if you own your own washing machine, or you wish you could get cleaner clothes? Filtering the water right at the point of entry into the washing machine is an ideal solution. Reasonably priced and easy to install these in line water filters specifically for use by the washing machine are an ideal option. They specifically protect your washing machine from the sediment build up on the inlet valve screen that can slow filling, make clothes get dingy over time, or create bad smells in the washer. The In Line – Water – Filters – 85470 washing machine filter system will prevent sediment build up that will damage your valuable appliance. The system traps the sediment in the water before it gets to the inlet valve screen, so there is no more cleaning of the valve screen again. The INLINE – WATER – FILTERS – 85470 reduce well water contaminant sources to about 4.5 G P M. Public water sources are typically experiencing about a 10 % reduction in the flow rate. The filter measures 6.6 inches x 2.1 inches x 7 inches, which is well small enough to fit behind a washing machine. 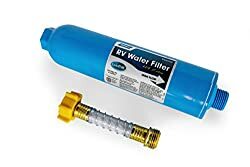 The Camco Taste PURE KDF RV Water Filter is a large capacity RV in line water filter that is designed to last an entire summer camping season. The Granular Activated Carbon filter provides safe drinking water from any available potable water source. It greatly reduces bad odors and tastes, rids the water of chlorine and sediment with a 20 micron sediment filter. It is perfect for use at campsites. The durable in – line, exterior mount filter uses a wider body that increases the water flow. Included is a flexible hose protector. It is not designed for fish ponds or tanks as no testing has been done for that purpose. Made in the USA. The high – flow carbon filter with K D F prevents the growth of mold, fungus, and bacteria inside of the filter when it is not being used. The Taste PURE Water Filter has Granular Activated Carbon (G A C) filtration so you have safe drinking water from any potable water source. The K D F helps prevent any bacteria growth when you are not using the filter. The package includes a flexible hose protector to minimize the kinking that might impede the water flow. When you are first attaching your filter to the water source, it is vital to allow the water to run freely for several minutes to flush out the initial loose carbon bits from out of the filter. When the water starts running clear, the filter is ready to be used. The Taste PURE Water Filter will attaches to standard water and garden hose connections. You can use this product at your campsite to keep sediment out of the RV water tank plus improve the smells and taste of your drinking and cooking water for the whole summer season. It can also be used it in the garden for reduced chlorine watering of your garden plants and when you are washing your car so it reduces annoying mineral deposit spots. The Taste PURE in line Water Filter is also great for filling up a pool or hot tub, for your home brew, and for boating or marine use. Whether you need an inline water filter for your refrigerator, a commercial ice maker, your washing machine, RV or your whole house, there are many options available. Look for a ready supply of replacement filters, or be willing to replace the entire unit on the schedule the filters require replacing. There is no longer any reason to be buying bottled water in disposable water bottles when a fresh, clean, abundant water supply is easily installed and maintained in every home and office in America. Water quality is less and less reliable all over the country. The water crisis in Flint, Michigan, has heightened the awareness about the importance of clean drinking water and potential contamination nationwide. Here in America the water quality is better than it is in other nations. That is why you have been warned to not drink water from the tap if you are traveling to some foreign countries. The Safe Drinking Water Act , according to the EPA, has defined water contaminants extremely broadly. They have defined a contaminant as anything in the water that is not a water molecule. That means that not everything that is defined as a contaminant is unsafe to drink. For example, dissolved minerals that are found in 80% of our water are not health risks, although some of the minerals like magnesium and calcium can create hard water issues. There are a lot of contaminants in water that can create health problems. The Water Quality Association provides a list of common contaminants found in water and has documented the potential risks. Chemical – whether man made or naturally occurring. Physical – organic materials or sediment that can change the water’s physical properties. Radiological – chemical elements emitting radiation like plutonium, cesium, or uranium. Biological – microorganisms such as parasites, bacteria, and viruses. Groundwater can be contaminated by man made products like oil, gasoline, or road salt or other chemicals getting into the groundwater. These can cause the groundwater to become unsafe and sometimes even unfit for human use. Some materials from the surface of the land can move through soil and thus end up in groundwater. These materials include fertilizers, pesticides, and other agricultural runoffs such as manure, or toxic materials from leaky landfills or hazardous waste sites. Of course most Americans are drinking municipal water. This is water that has been processed at a water treatment facility before being delivered to households and businesses. This should be making this water perfectly safe for everyone to use. The municipalities have to add chemicals to water in order to treat it. Of course the most common chemical encountered is chlorine, which is why residential tap water often smells of chlorine. Chlorine is used to disinfect and kill bacteria and the other microbes in the water. Sometimes treatment facilities will use chloramine, which is a combination of both chlorine and ammonia. Water quality would surely be significantly worse if our municipalities were not using chemicals to eliminate that which could be harmful in the water. The World Health Organization states that any health risks from chlorine are very small when they are compared to the many dangers of not properly disinfecting the public water. Many things could affect the odor, flavor, or appearance of tap water, and they are not necessarily all harmful. Many households with public water sources can smell and taste the chlorine. Private wells are sometimes contaminated with chemicals like sulfur which can smell, or iron that causes staining and discoloration. The amount of total dissolved solids (TDS) in tap water affects the smell, taste, and its appearance. These issues are not really serious health concerns, they are certainly a nuisance, and many health conscious individuals prefer to work toward optimal health, as opposed to simply avoiding serious health concerns. In line water filtration systems, can provide solutions.